A great-granddaughter of Kamehameha, a grand-niece to Kamehameha II and III, and a half-sister of Kamehameha IV and V, Ruth Keʻelikōlani was born in Pohukaina, O‘ahu on February 9, 1826. After Pauahi’s death, Kekūanāoʻa married Kīna‘u, and they became the parents of Lot Kapuāiwa, Alexander Liholiho, and Victoria Kamāmalu, making Keʻelikōlani a half-sister to these three. Her mother, Pauahi, died while giving birth to Keʻelikōlani, who was then cared for by Kamehameha’s wife, Ka‘ahumanu, who herself died six years later. The Princess was then sent to live with her father, Kekūanāoʻa, and her stepmother, Kīnaʻu. At the age of sixteen, Keʻelikōlani married William Pitt Leleiōhoku. While serving as governor of Hawai‘i Island, Leleiōhoku died, only twenty-two years old. They had two children, only one of whom – William Pitt Kīnaʻu – survived childhood. Tragically, he died at the age of seventeen in an accident on Hawai‘i. In 1862, they had a son, Keolaokalani (‘The Life of the Heavenly One.’) (No one knew then that Keolaokalani would be the last baby born into the Kamehameha line.) Keʻelikōlani gave him as a hānai to Bernice Pauahi. Then Lot insisted that she adopt William Pitt Leleiōhoku II, King Kalākaua’s youngest brother and heir apparent. She did; however, Leleiōhoku predeceased Ruth. Determined to uphold the honor of her ancestors, she retained many traditional religious practices. Although she learned English among other subjects at the missionary-run Chief’s Children’s School, she was a staunch supporter of the Hawaiian language and traditional cultural practices. 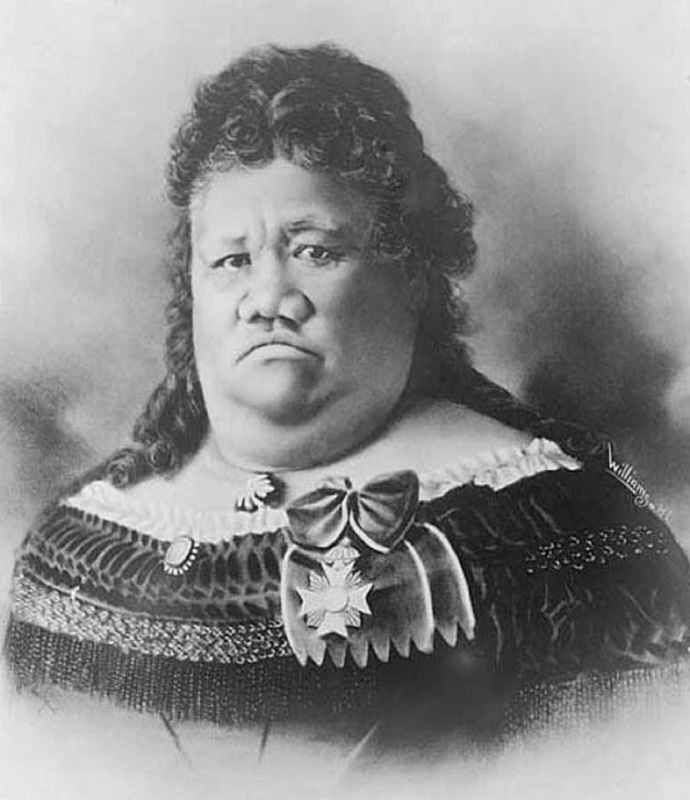 By the time King Kalākaua was elected, Keʻelikōlani was the richest woman in the kingdom, having inherited the estates of her parents and siblings. Despite owning Huliheʻe Palace, a Western-style house in Kailua-Kona, she chose to live in a large, traditional grass home on the grounds of that oceanfront property. She later chose to build Keōua Hale, a large, ornate mansion on her land in Honolulu. Keōua Hale was a Victorian-style mansion, and the most expansive residence of the time; it was larger than ʻIolani Palace. The house was completed in 1883; however, Princess Ruth Keʻelikōlani never lived in the palace. She became ill immediately after the house warming and birthday luau. Her doctors recommended that she return to Huliheʻe, her Kailua-Kona residence, where they believed she would more quickly regain her health. She died in 1883 at Haleʻōlelo at her large native-style home (thatch house) on the grounds of Huliheʻe Palace in Kailua, Hawaiʻi. The image shows Keʻelikōlani in 1877; in addition, I have added related images in a folder of like name in the Photos section on my Facebook and Google+ pages.